Boss Neil Reynolds believes a change of mentality is needed if Bamber Bridge are to pull themselves out of their current malaise. Brig suffered a 1-0 defeat away to Ramsbottom United on Saturday – their 1oth defeat in their past 14 league games. Reynolds – who has picked up one win out of six in the NPL First Division North since taking over from Neil Crowe last month – believes his men are struggling to break free of the losing habit. “I look at what Accrington Stanley manager John Coleman said a few weeks back,” Reynolds said. “John said that he’s got a lot of very good players in his squad at Stanley, but they’ve got used to losing. “I kind of understand where he is coming from. “There are a lot of good players in my squad, but for some reason it’s just not happening for us. It has not been all doom and gloom for Reynolds in his first few weeks in the role. He has presided over two excellent wins in the NPL League Cup, as he continues to put his own stamp on the team in terms of playing style and personnel. He is eager to strengthen with new additions while earlier this week made his first major decision with regards to the squad he inherited. Striker Ben Wharton is the first major casualty of the new manager’s plans and has left the club on Monday after Reynolds deemed him to be surplus to requirements. Last week, Matt Mahoney returned to the club from Burscough, and Reynolds has also swooped for Prescot Cable’s combative midfielder Sam Staunton-Turner. 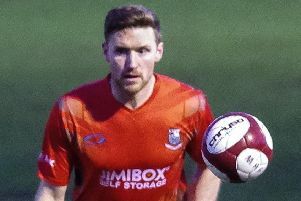 Mahoney was on the bench at the weekend – and unfortunately conceded the penalty which led to Ramsbottom winning. Turner is expected to come into the reckoning for this weekend’s home game against Radcliffe Borough after a enjoying full week of training at his new club. Winger Aaron Fleming has also been training with the squad as he looks to win a permanent deal at the Sir Tom Finney Stadium. “Sam is a combative midfielder, but can also play a bit,” said Reynolds. “He actually reminds me a bit of myself. Aaron is a left-winger and has spent the past 18 months playing in Holland. “He used to play for AFC Fylde, but he’s come back and has been training with us. table, but Reynolds has challenged his men over the remainder of the season to achieve a play-off place and win the League Cup. On the injury front, Chris Marlow is a doubt with an ankle injury.